Open mat time is available to allow you access to a location to train your dog and work on skills you want to work on, in a training facility environment. Please check the calendar for available open mat times (and contact us if you don't see the times you like so we can take it into consideration in our schedule!). Pricing is $5/30 minutes, to allow you to stay as short or long as you need without requiring payment for more time than you will use. Make sure to ask us about our buy 6, get one free! punch card! 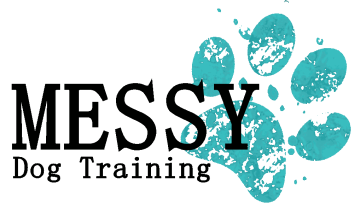 Testing for the Canine Good Citizen (CGC) and Trick Dog titles are now offered at MESSY! Please check the calendar page for test dates and times. Test slots are reserved in advance for each, and the test fee is $10.00 (not including fees payable to the AKC if your dog passes). If you wish to test for more than one Trick Dog title on the same night (Novice and Intermediate, for example), each title test will be $10.00. Stop by MESSY Dog Training during open mat times to see our growing selection of items for sale, including various styles of clickers, wrist coils, local handmade collars and leashes, and dog tug toys! ​We also offer dog themed gifts for the dog lovers in your life.